For an individual with communication disabilities, devices which can help them more fully participate in their social environs are priceless. The Accent 1400 features a large, 14" high-definition, touch-screen display and bigger icons. Screen and icon size is especially important for children and adults who must use alternative access methods, such as eye-gaze, head-tracking, or switch scanning, to operate an AAC device due to physical disabilities. Cheap Talk 4 with the switches arranged in a line. Activated by pressing one of the 4 message squares. 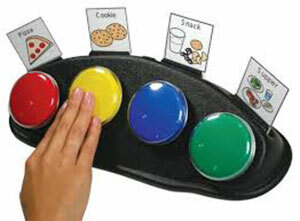 The ProxTalker is a direct selection communicator and communication board designed for use by individuals with cognitive, communication or speech disabilities. A complete set of five talking puzzles. Record messages for each puzzle on a separate level of the communicator. Easy to record and easy to change subjects. The Talkable 4 compact message communicator comes with built-in icon holders and clear covers. Records of the 20 seconds in four different messages. The Tobii-Dynavox I-110 is a small, portable communication aid for text and symbol based communication. 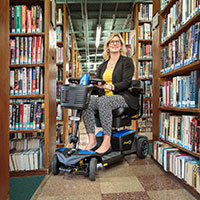 The Tobii-Dynavox I-110 is suitable for users who are ambulatory and have use of their hands. 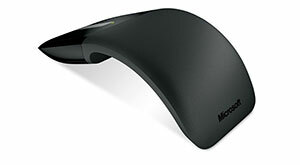 The Arc Touch Mouse's design allows for quick use and storage. Curve it comfortably to get started. Then smoothly glide your finger up or down the touch strip. 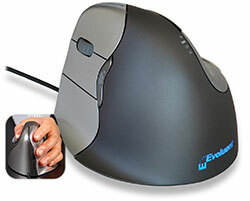 Simply flatten the Arc Touch Mouse to turn it off. The BIGtrack has a 3 inch trackball. The large ball requires less fine motor control than a standard trackball. 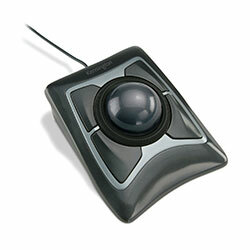 It has a left and a right mouse click button located behind the trackball to avoid unwanted mouse clicks. The patented shape supports your hand in an upright neutral posture that generally avoids forearm twisting. The shape is thoughtfully sculpted for uncompromised comfort and easy-to-reach programmable buttons. No finger contortions are needed to operate the buttons. The Kensington Expert Mouse uses Kensington's Diamond Eye optical technology and comes with a soft new wrist rest to increase comfort while mousing. Start early! Give your child the best from the get-go with these great learning toys. 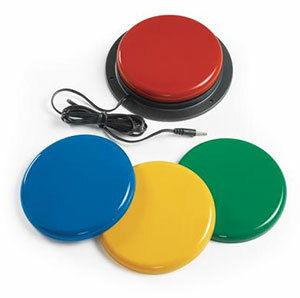 Gel Pad Activity Center provides auditory, tactile and visual experiences.Three different gel pad switches provides opportunities for exploration. 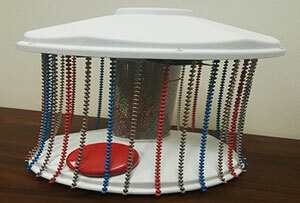 Bead chains spin around for a tactile experience with blinking lights and music. Plug for any standard adaptive switch. 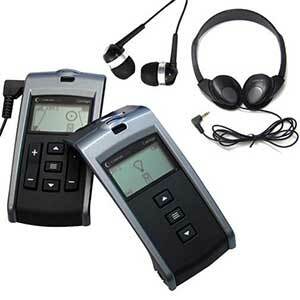 Attendees will be impressed with the variety of communication aids available for those with auditory disabilities. Come and test ingenious devices which can help connect you with the hearing world. 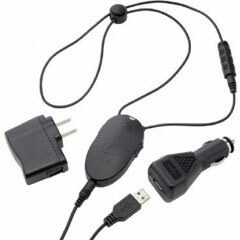 Reduce interference between cell phones and hearing aids with this portable amplifier. 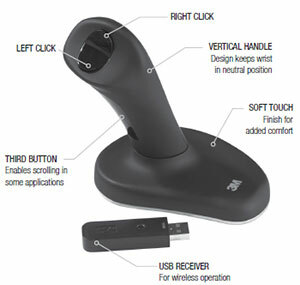 It is compatible with any device with a Bluetooth transmitter inubicluding cell phones, cordless phones, computers, and MP3 players. T-Coil compatible and easy one touch answering. 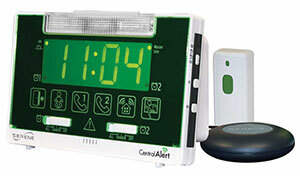 The Central Alert 360 is an all-in-one notification system for your home. 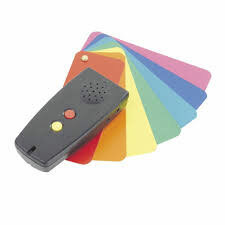 It alerts you to all the daily sounds in your home such as alarm clock, door knocking, phone ringing, alarm sound from your audio alarms, motion detectors, and storm warning from your NOAA radio. The Comfort Contego is a unique, wireless communication system designed to improve and enhance the quality of sound. The E-Scope II stethoscope for ITE hearing has Low-frequency headphones are provided that should be placed over the ears. The ITE hearing aids are not removed. Two specialist heads (bell and diaphragm) are included. Mino Personal Amplifier is a communication aid that uses digital state-of-the-art technology to enhance speech in small group conversations, family gatherings, and outdoors. Ditto is a tiny clip that vibrates when you receive an important call, text or message and is customizable with the free app. PLA 90 is a portable countertop induction loop system that provides listening assistance for individuals with t-coil hearing aids at public customer spots. The Sonic Bomb is a powerful vibrating alarm controlled by your smartphone. Its vibrations are guaranteed to wake up even the heaviest of sleepers! 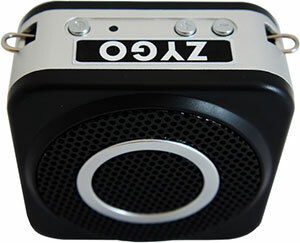 Wireless voice amplifier with a 12-watt speaker and wireless, clip-on, lapel microphone using adaptive 2.4 GHz digital auto-pairing. The Big Red® activation surface provides a large target area to turn mechanical devices on/off with minimal effort. It plugs into any switch-adapted device with a standard, mono 3-1/2 mm switch jack. 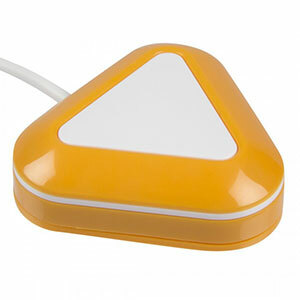 The candy corn proximity switch is a highly sensitive electronic sensor switch, requiring no force. The auditory and visual feedback provides the indication that the switch has been activated. The flashing blinker helps visually impaired individuals locate the switch. 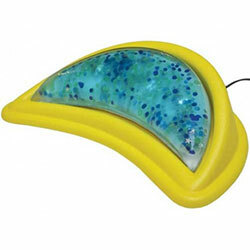 When the switch is activated, the yellow textured lens lights brightly while music plays and the switch vibrates. Soft and sparkly, Gooshy Switch has lights, vibration and music. Control allows the user to select any or all of the features. It can be also be used alone as a sensory device. The slightest touch rewards the user with a choice of lights, vibration and/or music. This item has a special control, which allows the user to select any or all of the rewards. This item is also a switch and can be used to activate other devices. Why let low vision stand in the way of doing the things you want to do? 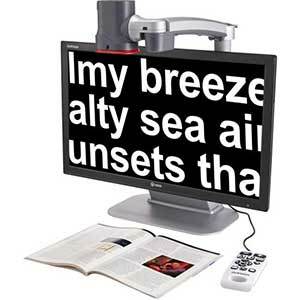 Take advantage of assistive technologies which help to bring your environment into focus. 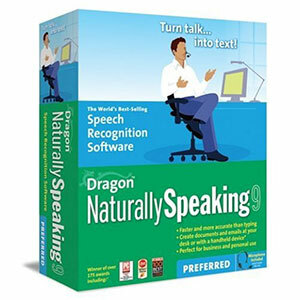 Dragon NaturallySpeaking lets you create documents and e-mails using only your voice, a computer and Dragon software. Use your voice to dictate, edit and control applications like Microsoft Word, Microsoft Excel, Microsoft Internet Explorer, and WordPerfect. 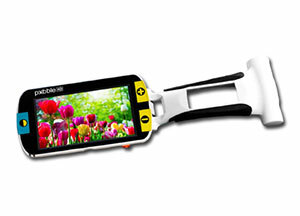 The GoVision provides a 24" LCD Transportable read, write and distance video magnifier with build-in OCR, USB port and is compatible with phones, tablets and computers. JAWS reads aloud what's on the PC screen. 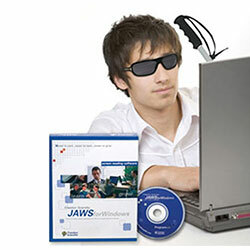 JAWS enables you to work with Microsoft® Office Suite, MSN Messenger®, WordPerfect, Adobe® Acrobat Reader, Internet Explorer™, Firefox™—and many more applications that are used on a regular basis on the job and in school. 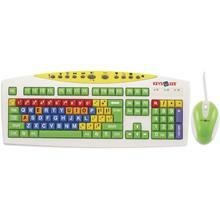 This large print keyboard comes with a compact, color coordinated mouse, and features color coded keys to highlight vowels, consonants and numbers. Keys U See for Kids. Jordy is a battery-operated, full-color portable system that can be worn like a pair of glasses to see near or far. 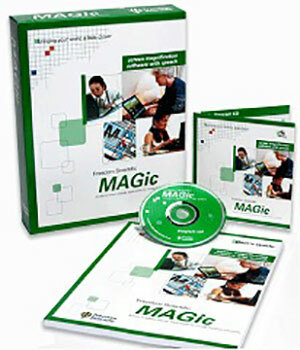 MAGic screen magnification software increases the size of what you see on a monitor, and MAGic with Speech also speaks aloud screen contents. Pebble HD has a new HD camera providing a high definition picture. The new lightweight compact design let you carried at your purse, pocket, or clip it on your belt with the included carrying case.